The release of the Framework follows an announcement in late 2017 by Inuit Tapiriit Kanatami President Natan Obed and the Honourable Jane Philpott, Minister of Indigenous Services, to launch an Inuit TB Task Force, and a joint commitment made in March 2018 to eliminate TB among Inuit in Inuit Nunangat by 2030, with an interim reduction in the reported rate of active TB of at least 50% by 2025. The Framework reflects input and guidance from the Inuit TB Task Force and the Inuit Public Health Task Group (IPHTG). 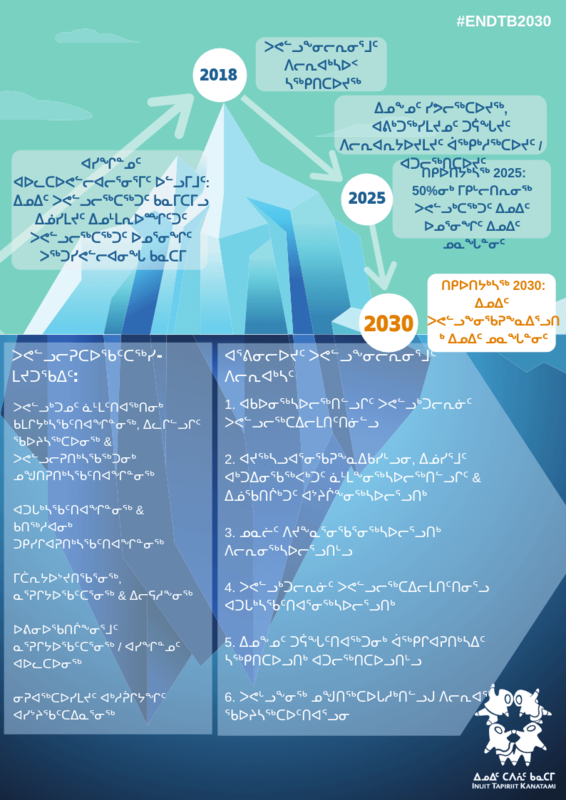 The IPHTG is made up of representatives from the four Inuit regions alongside provincial, territorial and federal governments. 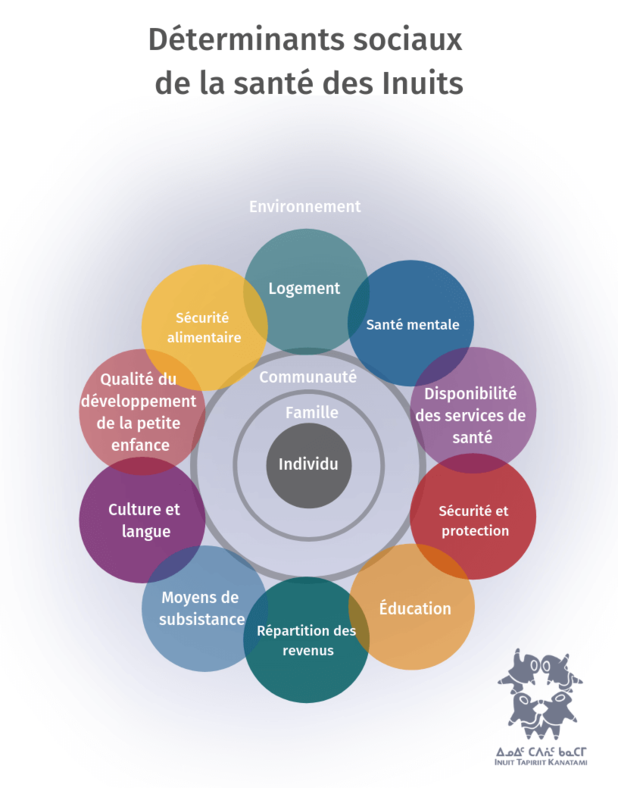 These priority actions will be used by the four Inuit regions to design and implement TB elimination action plans that are customized to reflect each region’s priorities, needs and strengths. Using this approach will also ensure the interventions and activities described within each action plan are informed by local TB epidemiology and health systems. The regional TB elimination action plans are expected to be released by March 2019. TB can be either latent (where TB bacteria are inactive in the body, not causing symptoms and cannot be spread to others) or active (where TB bacteria are active, causing symptoms and can be spread to others). Latent TB infection can be diagnosed using either a tuberculin skin test, or an interferon gamma release assay (blood test). Active TB affecting the lungs and airways can be diagnosed using sputum testing, and a chest x-ray. Both latent TB and active TB can be treated with antibiotics. Left untreated, latent TB can develop into active TB. Active TB can be fatal without treatment. For most people in Canada, the risk of developing active TB is very low. However, the rates of active TB are higher among Indigenous peoples, and they are particularly high in some Inuit communities. 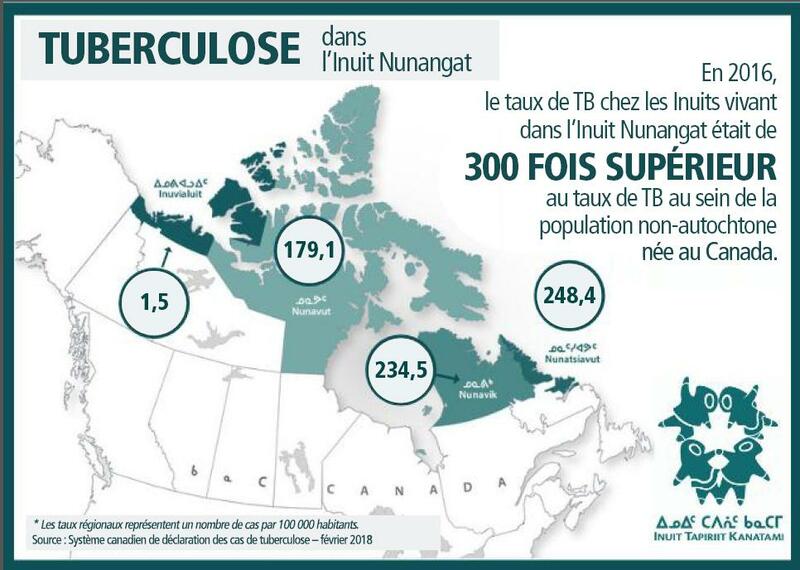 The reported rate of active TB among Inuit in Inuit Nunangat was over 300 times the rate of Canadian-born non-Indigenous people in 2016. This high rate is rooted in multiple factors, including inadequate housing, food insecurity, poverty, stigma, and the enduring impacts of government-led TB control measures during the 1940s and 1950s that transported many Inuit south by ship to TB hospitals thousands of kilometers away from their families and communities. Those who survived did not return home for several years. In some situations, the fate of those who did not return remains unknown. In 2016, there were approximately 65,000 Inuit living in Canada. 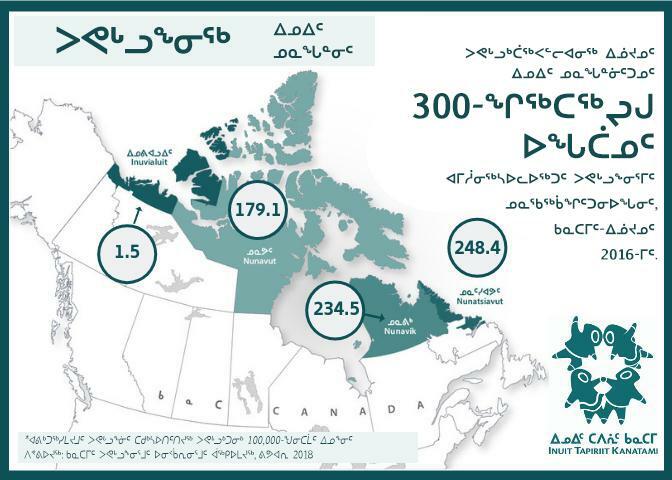 Almost three quarters (72.8%) live within four Inuit regions in Canada, collectively known as Inuit Nunangat. The Inuit Regions are the Inuvialuit Settlement Region in the Northwest Territories, Nunavut, Nunavik (the Northern region of Quebec), and Nunatsiavut (the Northern region of Labrador). Although there are some significant differences in health status throughout Inuit Nunangat, there are also some common themes across the four regions. According to Statistics Canada, life expectancy for Inuit is 10.5 years lower than the Canadian average; 52% of Inuit live in crowded homes; food insecurity is widespread; and 52.5% of Inuit are unemployed. The Government of Canada is committed to working collaboratively with provincial and territorial partners and Indigenous leaders to address health and socio-economic factors contributing to the high incidence of active TB. 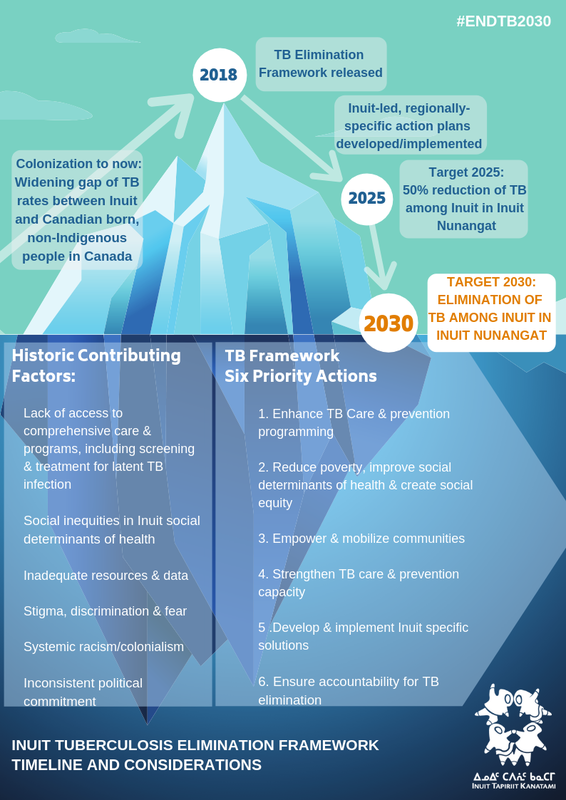 In 2013, Inuit Tapiriit Kanatami (ITK) developed the Inuit-specific Tuberculosis Strategy to increase awareness of the need for more effective approaches to TB prevention, control and care, and to present a path forward for reducing the rate of active TB in Inuit Nunangat. The Government of Canada and Inuit leaders met in September 2017 under the Inuit-Crown Partnership Committee and pledged to establish a Task Force to eliminate TB across Inuit Nunangat. To streamline coordination of this elimination work, efforts have continued through the Inuit Public Health Task Group; a subcommittee of the National Inuit Committee on Health (NICoH), which is a forum that has been in place for many years representing Inuit organizations and public governments. The Framework was approved by the ITK Board of Directors in November 2018. The framework will be used to inform the development of regionally-specific tuberculosis elimination action plans by the four Inuit regions. These action plans, anticipated to be finalized and initiated by late March 2019, will outline concrete steps, such as strengthening community-based capacity to increase awareness and understanding of TB, reducing stigma, and enabling earlier diagnosis and treatment of active TB disease and latent TB infection. As announced in Budget 2018, the Government of Canada is investing $27.5 million over five years in ITK’s Inuit-specific approach to tuberculosis elimination in Inuit Nunangat. This is in addition to the $400 million over 10 years for an Inuit-led housing plan in the Inuit regions of Nunavik, Nunatsiavut and Inuvialuit. In Budget 2017 an announcement of $240 million over 10 years was made to support housing in Nunavut. 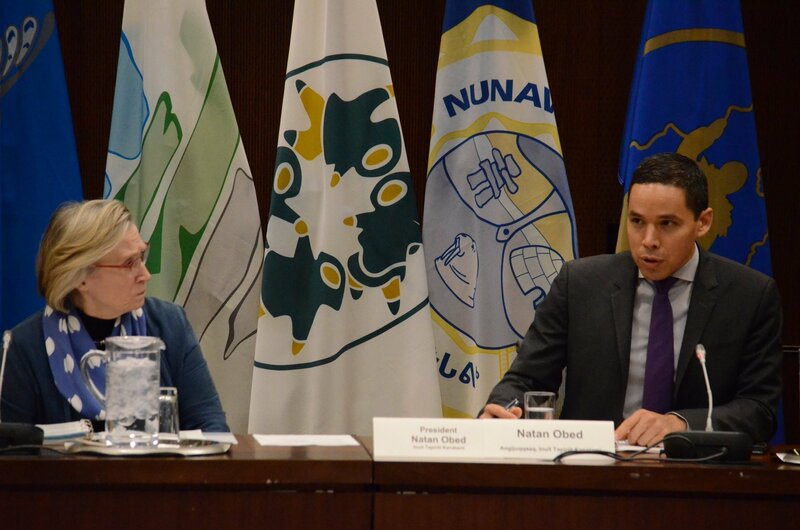 On March 23, 2018, Minister Philpott and ITK President Natan Obed announced their commitment to eliminating TB across Inuit Nunangat by 2030, and reducing the incidence of active TB by at least 50% by 2025. Work is currently underway in each of the four Inuit regions to develop regionally-specific TB elimination action plans. Providing financial and human resources to support outbreak response activities. Collaborating with Inuit partners to implement Budget 2018 funding of $27.5M over 5 years to eliminate TB in Inuit Nunangat. Investing in the acquisition of rapid TB diagnostic technology for Nunavut. Adding Rifapentine to the List of Drugs for Urgent Public Health Need, a new regulatory pathway for access to medications currently unlicensed in Canada. The Government facilitated timely access to Rifapentine, a shorter course of treatment used for latent TB. Working with the Nunavut Department of Health to enable the expedited importation of Rifapentine. Supporting the Taima TB 3HP Project, which is working in Nunavut to assess the cost-effectiveness of 3HP (which includes the treatment combination of Rifapentine and Isoniazid) for latent TB treatment among persons at increased risk so that they do not develop active TB. Establishing a TB Working Group, comprised of representation from the Government of Nunavut, Indigenous Services Canada and the Public Health Agency of Canada, to coordinate federal efforts across surveillance, testing, treatment, promotion and awareness, and action to address underlying risk factors of TB. Working with the Nunatsiavut and Newfoundland and Labrador governments to support efforts to address the recent TB outbreak in that region. Working with Inuit Leadership on the Nanilavut Initiative, that begins to address the wounds caused by the Federal Government’s approach to the TB epidemic of the 1940s-1960s. There were 1,737 cases of active TB reported in Canada which translates into an overall incidence rate of 4.8 cases per 100,000 people. The reported incidence rate of active TB among Canadian-born, non-Indigenous people was 0.6 cases per 100,000 people. The reported incidence rate of active TB among Inuit living in Inuit Nunangat was 170.1 cases per 100,000 people, which is more than 300 times the rate reported for Canadian-born, non-Indigenous people that year.